the brick wall is 30 feet wide and 40 feet tall. a 20 foot tall 30 foot deep brick box is right of the brick wall. a 25 foot wide white kitchen counter is 5 feet in front of the brick wall. a 5 foot tall 3 foot wide 4 foot deep purple dragon is 2 inches behind the kitchen counter and 12 inches above the ground. the dragon is -50 inches left of the kitchen counter. a 5 foot tall blue penguin is 20 inches right of the dragon. a black hat is in the penguin. a 3 foot deep sandwich is on the kitchen counter. the sandwich is -35 inches to the left of the dragon. the sandwich is facing left. an ocelot is facing right. 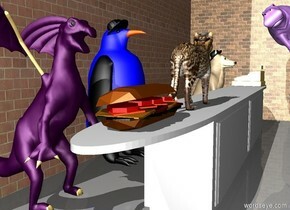 the ocelot is 2 inches right of the sandwich. a 7 inch wide black visor is -4 inches above the ocelot. the visor is facing right. the visor is -10 inches to the right of the ocelot. a 5 foot tall tan dog is 132 inches right of the penguin. a second black hat is -12 inches above and -23 inches in front of the dog. the second black hat is 10 inches deep. a cash register is 140 inches to the right of the ocelot. the cash register is facing the dog. a lavender hippo is 10 inches in front of the dog. the hippo is 5 feet above the ground. the hippo is facing the ocelot. the hippo is leaning 40 degrees toward the right.